LG G4 bets on leather finish, microSD and removable battery | What Hi-Fi? LG has officially unveiled the G4, its latest flagship smartphone. There have been quite a few leaks and glimpses over the last few months, but here is the official word. The LG G4 (on sale May 28th) is the successor to the LG G3, which was one of the best smartphones of 2014, and a multimedia beast. There are a lot of tweaks and improvements. Let’s start with the screen. The G3 was one of the first smartphones to have a Quad HD (2560x1440) screen, and this has made it to the G4. But it’s not just about the resolution – the LG's 'IPS Quantum' panel promises 25 per cent increased brightness, and 20 per cent wider colour gamut for more accurate hues. There is a new and improved camera system, too. The G4 uses the laser focusing originally launched in the G3 but the new phone gets a 16-megapixel main sensor with a f/1.8 lens (versus 13MP on the previous model). That should mean you can take bigger, more detailed photos – and in lower light. LG claims its Optical Image Stabilisation (OIS) 2.0 is twice as stable as that found on the G3. There's also a manual mode for those who want more control over their snaps and the phone can even save your pics as RAW files. 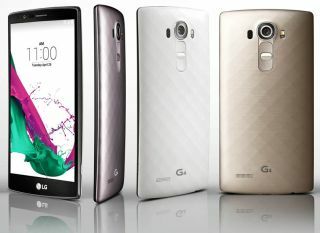 The front of the G4, meanwhile, has been fitted with an 8-megapixel camera. This is the age of ‘selfies’, after all. It's also the age of Ultra HD video, so it's good news that the G4 can also shoot in 4K - perfect for when you upgrade to a new Ultra HD television. Internally, the LG G4 features a Snapdragon 808 processor and 3GB of RAM. This isn’t Qualcomm’s latest processor, but the Snapdragon 810 (found in the LG G Flex 2) had overheating issues. Internal storage is 32GB, but as usual LG lets you add your own microSD card - something missing on the recent Galaxy S6 flagship phones. The device is powered by a 3000mAh battery, which is compatible with wireless charging. LG claims you'll get over a full day's use with a full charge. It is also removable, which makes the G4 somewhat of a rare beast – again, Samsung has removed this feature from its latest Galaxy handsets. Premium materials feature heavily in the LG's design. Instead of glass or metal, the G4 uses leather, available in a range of colours. This is genuine leather, not the leather-look material of the Samsung Galaxy Note 4. And if vegetable-tanned leather isn’t your thing, LG also offers textured plastic and there's even a ceramic finish too. There's also a very subtle curve to the body, which LG is referring to as its Slim Arc design. The curve isn't as prononounced as the that of its stablemate, the LG G Flex 2. On the software front, the LG G4 ships with Android 5.1 Lollipop. On top of this, LG has overlaid its new UX 4.0 interface. Much like Google Now, UX 4.0 promises to learn from your behaviour patterns and cater the experience on your habits. New features include QuickShot, where you double click the phone’s rear controls for rapid photo taking, even if the screen is locked. That’s good for snapping something you can’t miss, but for fussy photographers the real treat is the camera software. The G4 offers full manual camera settings, including shutter speed, aperture and white balance. The LG G4 is released in South Korea tomorrow, with a worldwide release expected soon after and UK prices to follow.